When we talk about compact sedans delivering luxury, we have a fresh the recently evolved Q50. 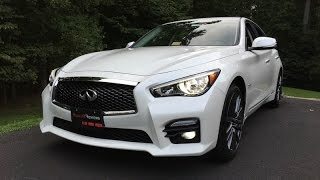 However it is the best-selling model in North America and to keep the same, Infiniti recently showcased the Infiniti Q50 2016. Housed by more powerful engine options the model features upgraded interior and aggressive body styling. 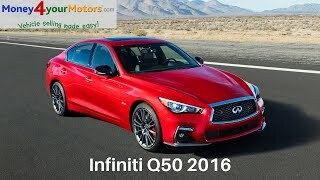 Let us have a look at the review of Infiniti Q50 2016 to know in details about it. 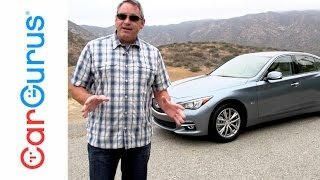 The interior of Infiniti Q50 2016 is almost a carryover of the model we saw in recent past. However there are few inclusions that bring the difference and the queue includes a new three-spoke steering wheel with dual multi-function pads. The paddle shifters behind the wheel are made from magnesium while the wheel comes with optional heating function and thus the new steering wheel delivers better comfort, grip and command. The center console comes with two touchscreens; first is an eight-inch unit while below it is a seven-inch screen, featuring infotainment options like SiriusXM traffic, new navigation system developed by company and voice recognition. Apart from these I didn’t notice any special change in the interior of Infiniti Q50 2016. The remaining remains almost same, especially the curving lines and use of high end materials that deliver a luxurious essence. Just like the interior, the exterior of Infiniti Q50 2016 remains almost unchanged and features ‘almost-the-same’ stance. Starting with the front fascia, model still carries the 3D mesh dual-arch grille amidst the recognizable elongated triangular shaped headlights. The hood gets a bit of curves and creases that make it look muscular while the same essence further marks its entity into the roofline, making the model look aggressive. Moving towards the rear end you’ll notice the chrome work surrounding windows, door handles and the door line at the side bottoms. The rear end gets the chrome finishing at the trunk while the bumper brings back the muscular creases. However to utilize the powerful engine to the best, company has brought a major change (though hardly noticed through eyes) with the unique exhaust tips. Another integration that adds to looks is the set of 19-inch aluminum wheels. 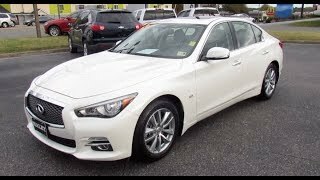 Thus rounding up the exterior details of Infiniti Q50 2016 all I would say is, it has aggression, class and the power to rule your heart. 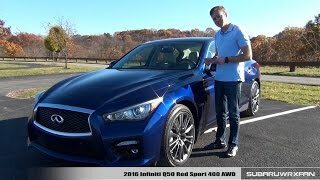 Powering the Infiniti Q50 2016 are five engine options, including a hybrid drivetrain. The list includes a 3.0 liter dual-turbocharged V6 generating total output of 400 hp and peak torque of 475 nm. The second is a less powerful version of the same engine that cranks 300 hp and peak torque of 400 nm. The third that we’ll talk about is a hybrid engine cranking 302 hp and peak torque of 350 nm through its 3.5 liter engine and is companioned with 50-kW motor producing 67 hp and peak torque of 270 nm. Thus the total output of the hybrid variant is 360 hp. The last two engine options in our list are 2.0 liter turbo and 2.2 liter diesel that cranks 208 hp and 168 hp and peak torque of 350 nm and 400 nm respectively. The performance figures of Infiniti Q50 2016 are not yet shared, but we expect to have some satisfying figures very soon.